A home library is a great idea but did you know you can create one in the tiniest space? Instead of dreaming about high ceilings and tall ladders, think about to convert the space you already have into a home library and reading nook. This will house all your precious books, keep them close and safe. This really isn't just about storage but about creating a space simply for the pleasure of reading books and hiding away for a couple of hours. Your library can hug a fireplace, your windows, a door, or an ugly column or pipe. This creates a functional reading space where none existed. 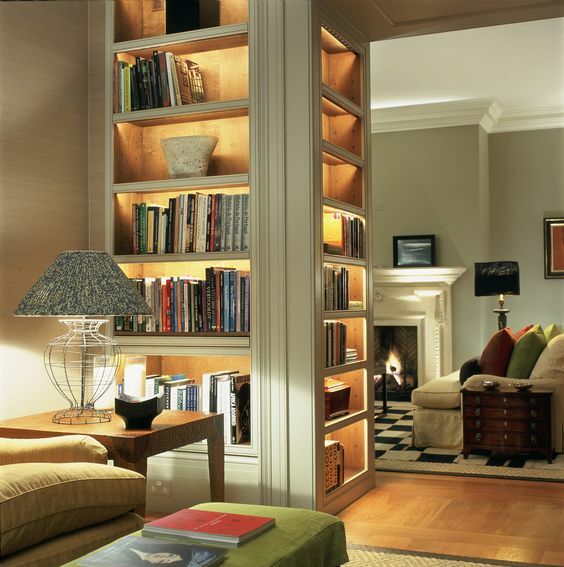 The bookcases above double up as a room divider and the bookcase lighting creates intimate spaces on either side. 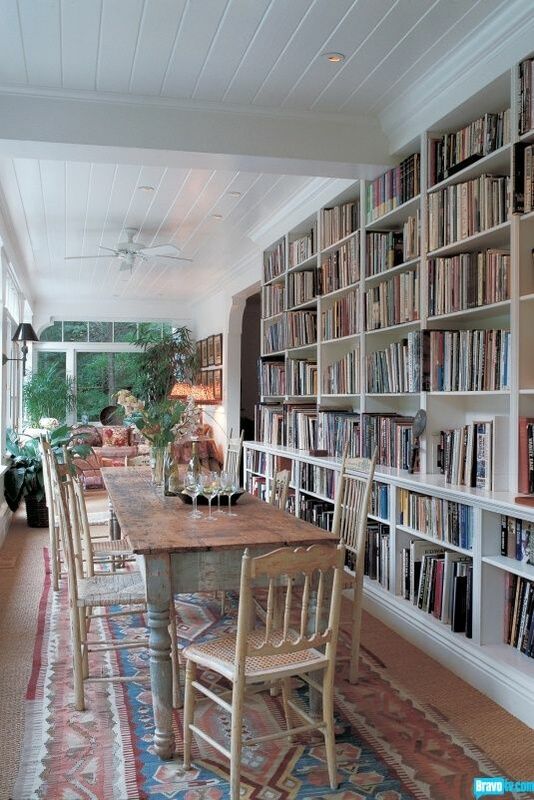 If possible have bookcases finish close to the ceiling to maximize storage. A wall of books creates a unified look. If your room is very small leave a gap between the floor and shelving. This makes the room feel bigger because the floor space appears larger. Painting book cases the same color as your walls helps to make your room feel bigger; unless you have a large room and would like to create a feature. Shelving should be narrow in hallways or small spaces, that way your library doesn't overwhelm the space and make it feel smaller. 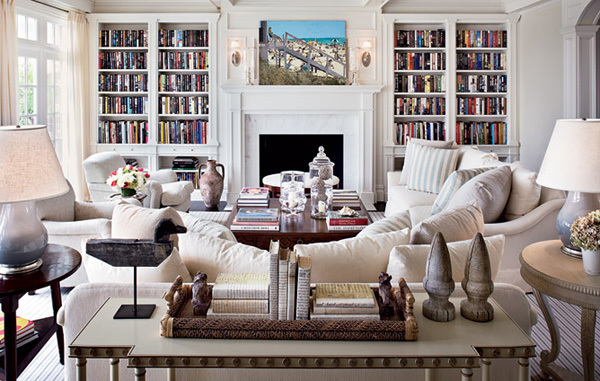 A home library in the living room is also a great feature and the perfect anchor to your living room. Built-in shelves can accommodate books, family photos and accent pieces. A narrow room can easily accommodate build-ins to create your home library. A hallway library can look spectacular. 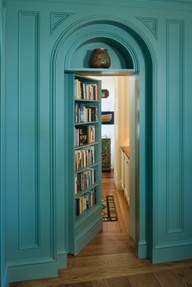 Your hallway should be wide enough for bookcases on each wall, as well as allow two people to pass. 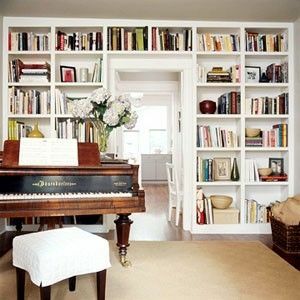 Use thin bookcases where possible; in the same color and the full length of the wall. Remember to add task lighting if you do not have a lot of natural light; books absorb light and your library can feel like a small dark cave if you aren't careful. 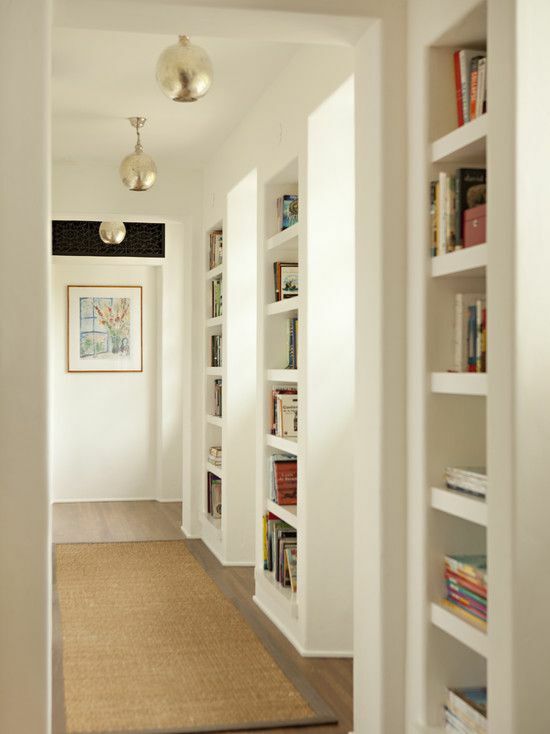 Your hallway library can live between windows, or on all four walls. Choose task lighting that can also create a great feature at night. Rug can help to define a space; enclosing it, bringing it together. Having all walls covered in book cases gives a sense of being in a library; a specially defined area just for books and reading. 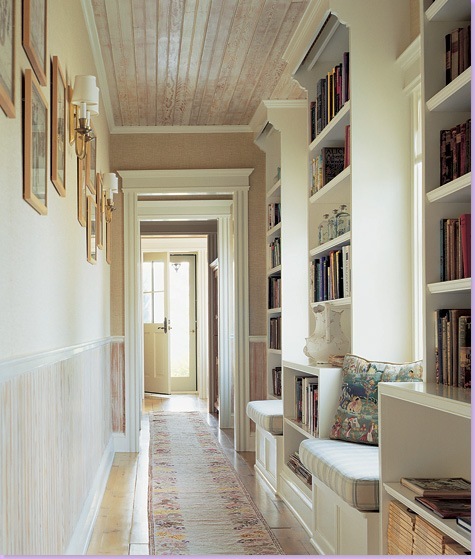 If your bookcases site neatly around windows, add window benches to create reading nooks. 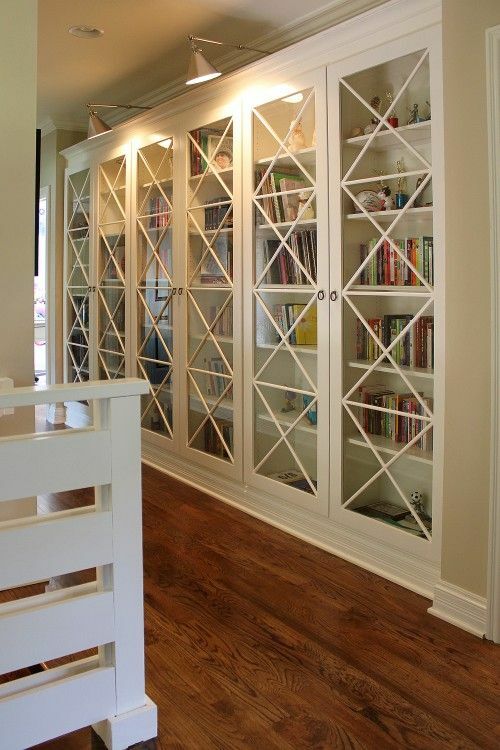 You can leave the shelves open, or use opaque or transparent glass doors for a more elegant finish. Reading nooks are the perfect hideaway when you can't go far. They can be created under windows; simply by adding benches. Add an ottoman or footrest and you have a secret spot where you could sit for hours. A window is always helpful for natural light, but your window can be in a tiny alcove, the end of all hallway or a corner of your bedroom. 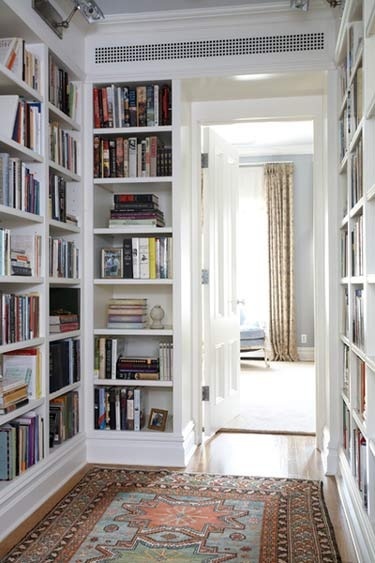 Turn your doors into a double act for storing books. Along with books and beautiful objects, its a stunning feature. 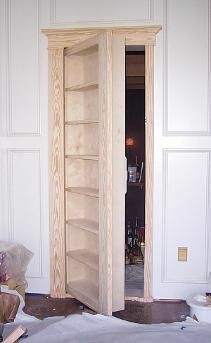 Here is how to create this door-book-case by installing a Murphy door. Its straight forward to install once you have the right door and hardware. 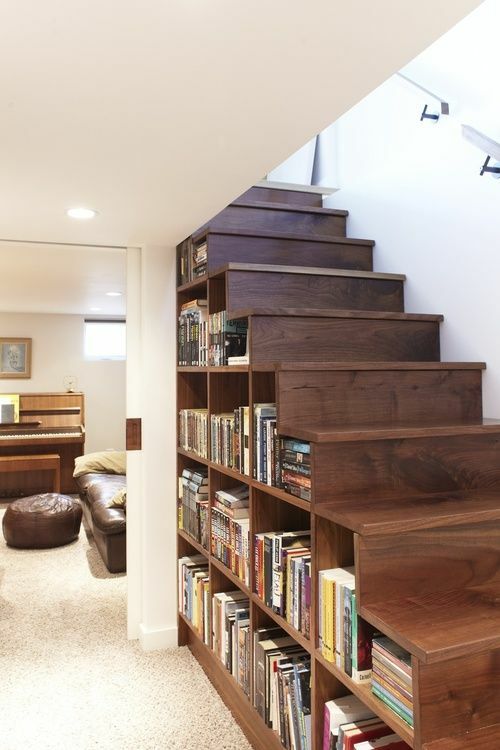 There are many ways to use your staircase as a library. How you use it will largely depend on your style of staircase. Depending on the size and shape of your space, you can add an armchair and lamps and make it very cozy. A reading nook under your stairs is a perfect use of space. 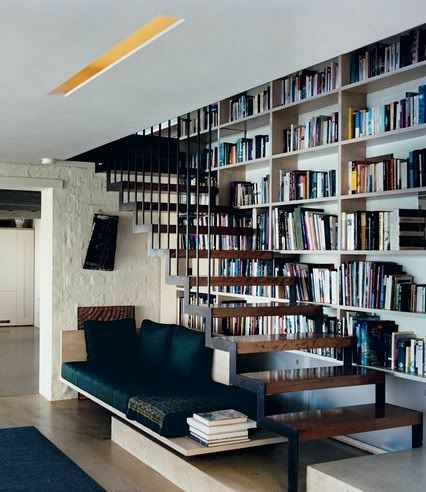 The sofa below acts as an informal day bed as well as a reading nook. If you are space deprived, think of clever ways to create your library by adding shelving that faces outwards, allowing you to stores books.